Looking for fun, low tech, high impact games to keep your guests busy? 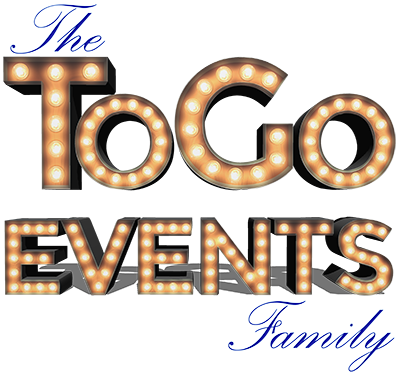 We can do that – plus we do it in a way that enhances the atmosphere and decor to make your event look as fun as it’s going to be!! All games come on a 4 or 6 foot table with red or red and white carnival style table covers. All events are quoted with delivery/set up/pick up. Attendants are not necessary, but are available if you feel they’ll be needed at your event. Of course there is an additional charge for attendants. 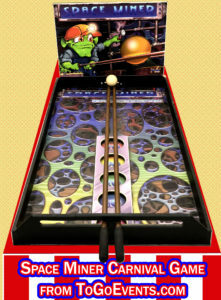 Space Miner is a jumbo version of the game we all played as kids where you separate the rods and get the ball to roll “uphill” as far as possible. Drop it into the highest scoring hole. This is one of those games that people bring their friends back to play over and over. Crazy Driver is another carnival classic! 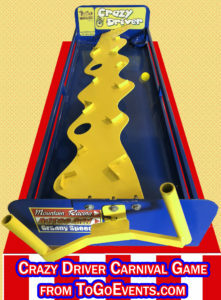 Players use a steering wheel to try to keep a ball from the top of an incline to the bottom cup without falling off the ledge or through a hole. Three different skill levels keep this fun for anyone! 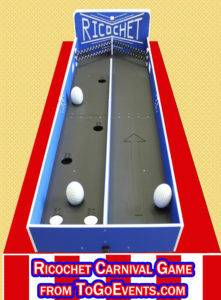 King of the Hill is a game where three balls are rolled, trying to get them into the holes with the highest points allocated. It’s not quite as easy as it looks, but it’ll keep them coming back to play time and time again. 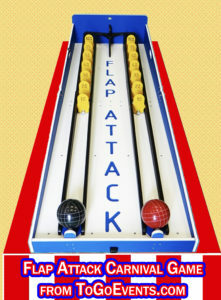 Flap Attack is a fun “just the right speed” rolling ball game. Two at a time can play. Roll your ball with just enough force to knock over the pins as high on the board as you can. But don’t roll too far or you’ll scratch and the ball will fall off the edge with no points scored! 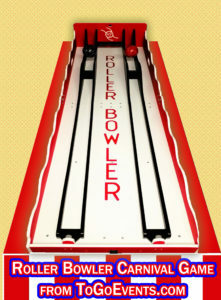 Roller Bowler is a classic carnival game where the players try to roll a ball over a hump with just the perfect amount of force that the ball stays between the hump and the back wall. They can’t hit the back wall or it’s a foul. It’s not as easy as it looks, but it is addictive fun! 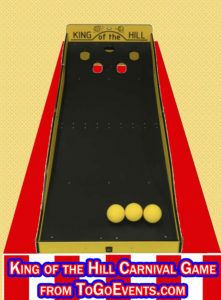 Many carnival games use balls. Not Leaping Lizards! Place a lizard on one end of the adjustable arm, aim, and hit the other end with the mallet to get your lizard to land onto a log or the surrounding leaves. Aim carefully to get the most points. 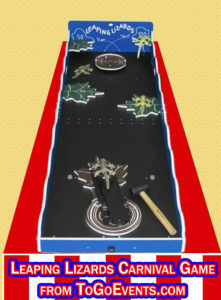 Players roll a ball down the lane, bounce off the ropes and into the other side where there are holes with points allocated. Play for fun or play for prizes. See who can score the most points among your friends.